This is a fantasy adventure game I designed and wrote for the Apple II in 1984-85. I began writing the game in my last year of high school and finished it up during my first year of college. A friend from high school, Kevin Christiansen, helped out by building the graphics routines for the Apple II version. At Sierra On-Line’s request, I ported the game to the Commodore 64 — which was only possible since it shared the same processor family — but required redoing all the graphics routines. The whole thing was written in 6502 assembly instructions and hand-linked(! )… yeah, crazy. It was large enough that I couldn’t fit all the code plus the current map and data in memory at once (even with a 64K requirement) so I had to fashion a system of loadable segments with known jump points — yeah, no dynamic linker available. When I designed The Wrath of Denethenor, I wasn’t much interested in creating a stats-heavy RPG or rolling characters with predefined roles. It was my intention that your character started out generic and you played it as you wished: heavy on magic or fighting or thievery, etc. I suppose you might say it was more of a hack-and-slash adventure game. What I wanted to focus on and enjoyed the most out of games at the time like Ultima was the exploration aspect. I also spent a lot of time to try to create effects and events and traps that were very specific and visual and not just “you’ve encountered a trap and lost 10 hit points”. It’s easy to see the influence of playing Ultima II and III, which led me to want to make a game using a similar graphic tile style. I obviously wanted to improve on Ultima though, adding various complexities (and sheer size) to make what I thought would be a fun adventure. 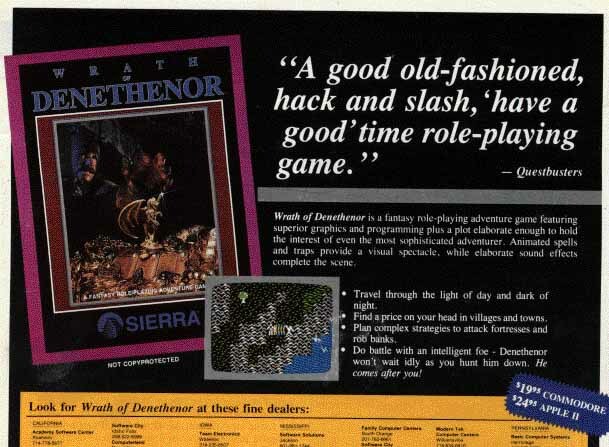 In hindsight, I probably should’ve avoided many of the tropes that Richard Garriott used in Ultima so that Denethenor wouldn’t seem so similar though. After finishing the game and giving it to friends to playtest, I submitted it fully completed to only three of the better known gaming companies at the time and heard back from Sierra On-line before ever trying to submit to anyone else. I guess it was unusual for gaming companies to receive such a large and fully complete and tested game, but I didn’t know any better. I had written some other things for friends to try in high school (like a simple text adventure) and I sold a customer database system (written in BASIC) to a local newspaper for $100(!). Anyway, they put it through their QA and I was happy to hear that their team was surprised to be unable to find few if any issues. Anyway, it was a fun experience and it was cool to be able to see it on the shelves and receive occasional letters from fans of the game. It was obviously never a big hit though. My original solutions guide to the game. A complete game walkthru/story that someone wrote and published through The Electronic Gamer. Another complete game walkthru from Game FAQ’s. Here’s some of the email I’ve received from fans over the years.